Classic silica materials for reversed phase chromatography are often limited to pH between 2 and 8 due to breakage of the siloxane bonds at low pH or dissolution of silica at high pH. In this work particle sizes of 1.8, 2.5 and 5 μm were evaluated allowing for both UHPLC and HPLC analysis. To show the workable pH range of these materials, different mixtures of drugs/pharmaceuticals and peptide test mixtures were analysed using both low and high pH buffers. With the possibility to use the phases in a wide pH range, selectivity can be improved by changing the mobile phase. In this application note, an example is shown for a set of anti-inflammatory drugs. without the use of gradient or raised temperature. In this application, separation of two different peptide mixtures employing Kromasil EternityXT C8 and C18, 1.8 μm particle size, under UHPLC conditions took place. 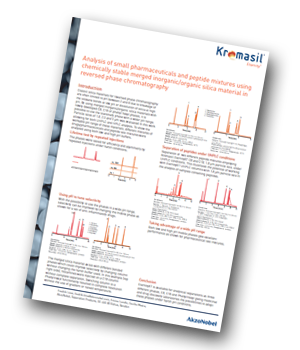 The potential of working with EternityXT UHPLC columns with 1.8 μm particle size in the analysis of samples containing peptides is demonstrated. Both low and high pH mobile phases are shown to give excellent performance in the example for pharmaceutical test mixtures. EternityXT is available for analytical separations as three different phases, C8, C18 and PhenylHexyl giving medicinal and drug discovery laboratories the possibilities to adopt these phases under harsh pH conditions.